The Emperor of China, being closer to the scene, was naturally able to register his displeasure sooner than Palmerston and Queen Victoria. 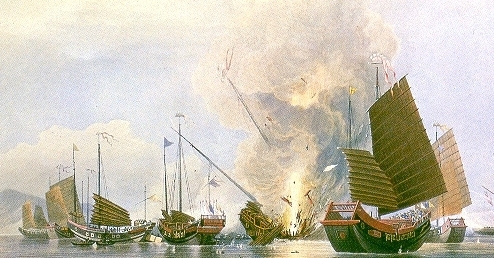 Elliot had not yet learned of London’s reaction to the Convention of Chuenpi, but when he saw the Chinese preparing for action he decided to strike first. Captain Elliot moved up the Bocca Tigris River, sending off landing parties to subdue the forts and defeating a squadron of forty war junks sent to stop him. The British did not hesitate to prepare an attack on the great city of Canton itself with its one million hostile inhabitants nor to pit their small force of 2,500 soldiers and 1,000 sailors and marines against a Chinese army of 45,000. They successfully occupied the heights overlooking Canton, the Chinese army retired in some confusion, and the inhabitants began to evacuate the city. At this point, much to General Gough’s disgust, Charles Elliot stopped the war and entered into negotiations with the Chinese, who agreed to pay six million dollars and to compensate the merchants for the destruction of their factories if the British would not press the attack on Canton. This deal, generally known as the ‘ransom of Canton’, was accepted. Aside from the superior leadership and discipline of the British force, the main reason for the success of the British over such large numbers of the enemy was the inadequate weaponry of the Chinese. The army of the Manchus was not much better armed than it had been when it conquered China more than two hundred years earlier: antique muskets and even bows and arrows were in use. While the sepoys were armed with old flintlocks – which made it almost impossible to fight in the rain – the British marines were equipped with percussion-lock Brunswick muskets which, although invented thirty years earlier, had just been adopted for issue and were far superior to anything the Chinese carried. There was a pause in the war after the ransom of Canton – and a change of faces on the China station: Charles Elliot, who had displeased his Queen and her ministers by signing the Convention of Chuenpi, was exiled to the newly created Republic of Texas, where he was appointed chargé d’affaires; he was replaced by Sir Henry Pottinger, uncle of the ‘Hero of Herat’; Captain George Elliot was invalided home and was replaced by Rear-Admiral Sir William Parker, a veteran sailor who had commanded a frigate under Nelson. Only General Gough remained. A fresh regiment, the 55th Foot (later 2nd Battalion, Border Regiment), newly equipped with Brunswick muskets, was sent out to him from India, and by August 1841 the British were ready to resume the war; an expedition was made ready and sent up the coast to attack Amoy. Little was known of China except its enormous population, its great extent, and its immense resources; we knew nothing of the social life of the country; we knew nothing of its communications than a scanty acquaintance with its rivers and canals; and whether their roads ran along rivers, or in any other way, nobody in this country could give any information, nor could any be acquired. Nevertheless, Amoy was easily taken with only two killed and fifteen wounded on the British side. Moving further north, Gough took Tinglai, Chinhai and Ningpo; then the British went into winter quarters at Ningpo and Chinhai. The spring campaign of 1842 was opened by the Chinese, who launched a massive counter-offensive, attacking the British both at Ningpo and at Chinhai. The Chinese were defeated at both places with heavy casualties. No attempt was made to count the bodies of the Chinese left on the battlefields, but old Peninsular veterans maintained that they had not seen so many dead since the siege of Badajoz. The British then moved out to attack the forts guarding the port of Hangchow. There they encountered the strongest resistance they had met within China from Tartar troops, but they captured the forts with a loss of only fifteen killed and fifty-five wounded. It was estimated that the Chinese lost more than 1,200 men, not counting the hundreds of civilians, men and women, who killed themselves rather than fall into the hands of the British barbarians. Shanghai was occupied without a fight in June. There was a last battle at Chinkiang, and then the army stood before the walls of the great city of Nanking. By now it was obvious, even to the Emperor, isolated as he was at Pekin, that the ‘foreign devils’ must be appeased, and so three Imperial Commissioners were sent to soothe the barbarians. Pottinger had his treaty terms ready and, as he would not tolerate any discussion, there was nothing for the commissioners to do but sign, which they did in August 1842. This, the Treaty of Nanking, was the first of a series of such treaties, giving special privileges to foreigners, which are known in Chinese history as the ‘unequal treaties’; they were to be a source of grievance and humiliation to the Chinese for a hundred years. The Treaty of Nanking gave the British 21 million dollars, the right to trade in five ports – the ‘treaty ports’ of Canton, Amoy, Foochow, Ningpo and Shanghai – moderate tariff rates, legal jurisdiction over British residents, and other points concerned with trading methods. Opium was not mentioned. What the British did not get, however, was the respect of the Chinese. Some nationalities respect naked military power, but the Chinese, at least in the last century when the most venerated man was the scholar, did not. Instead, they regarded the British much as the Romans regarded the Goths in the last days of the Empire. So, even after the war was won, the humiliating indemnification paid, and the special privileges obtained, the basic thorn of prejudice remained embedded in Anglo-Chinese relations. From a military viewpoint, the most remarkable thing about the Opium War is that it was one of those rare occurrences when a war was successfully directed by a committee. There was no supreme commander: Gough, Parker and Pottinger were practically independent agents in China for their own branches of government. That they cooperated so well, the military, naval and diplomatic functions meshing almost perfectly, was undoubtedly due to the great tact and diplomatic skills of Sir Henry Pottinger. The Queen wishes Sir Robert to consider, and at an early period to submit to her, his propositions as to how to recompense and how to mark her high approbation of the admirable conduct of all those meritorious persons who have by their strenuous endeavours brought about the recent brilliant successes in China and Afghanistan. Even when British subjects were not directly threatened, gunboats were needed on the China station to fight pirates. Between 1843 and 1851 the Royal Navy captured or destroyed about 150 pirate junks – at a considerable profit to the sailors who were paid £20 for each ‘piratical person’ killed or captured. British warships ranged as far south as Borneo in their search for pirates, and in 1845 landing parties even went ashore to destroy pirate lairs. Here they were aided by James Brooke, an Englishman who, acting on his own and without support from his government, carved out a country of his own, Sarawak, becoming its rajah in 1841. Gunboats were also necessary from time to time to impress the Chinese afresh by seizing a fort or making menacing gestures. After 1851, when the Taiping Rebellion started, the Chinese had too many domestic problems to be over concerned with the foreigners perched on their shores, but the two races did sometimes get in each other’s way and the result was often bloody, as it was in April 1854 when the Battle of Muddy Flat was fought – on absolutely dry ground. When an Imperial army camped on Soochow Creek near Shanghai and started to molest Europeans as well as Chinese, Rutherford Alcock, the British consul in Shanghai, demanded that the Chinese move their army elsewhere. Although Alcock had practically no force at his disposal, he couched his demand in imperious language: the camp must be moved by 4.00 p.m. the following day. The Chinese did not reply but moved a fleet of war junks up Soochow Creek to defend the camp. Alcock, with typical Victorian audacity, at once put together a tiny army of European civilians from the International Settlement, merchant seamen and a few sailors, including about a hundred men from the USS Plymouth. With two field guns and two howitzers, a drum and British and American flags, he marched off for the camp of the Imperial army. The war junks fired on them from Soochow Creek but, as Alcock had rightly anticipated, the Chinese soldiers fled when he brought his own guns into play. The battle was short and ludicrous, but 300 Chinese and four Europeans were killed.